Multi-hop wireless network has drawn a great deal of attention in the research community in recent years. Within the long period after it was proposed, the routing and forwarding operations in the multi-hop wireless network remain to be quite similar to those in the multi-hop wired network or the Internet, where the broadcast nature of the wireless medium is simply not utilized to enhance the data transmission ability in wireless network. Opportunistic data forwarding through node cooperation opens a new paradigm for data forwarding in wireless networks. In our work, we propose a series of solutions to realize opportunistic data forwarding in mobile ad hoc networks (MANETs). Our solution is called Cooperative Opportunistic Routing in Mobile Ad-hoc Networks (CORMAN). CORMAN comprises three important components: (1) a new light-weight proactive source routing scheme PSR; (2) a large-scale live update scheme achieve quick routing information update with no extra communication overhead; (3) a small-scale retransmission scheme to further utilize the broadcast nature and to enhance the efficiency and robustness of the opportunistic data forwarding in MANETs. Significant performance enhancement has been achieved in terms of throughput, end-to-end delay, delay jitter, and communications overhead, when compared with other routing schemes such as OLSR, DSDV, AODV, and DSR. Cheng Li received the B. Eng. and M. Eng. degrees from Harbin Institute of Technology, Harbin, P. R. China, in 1992 and 1995, respectively, and the Ph.D. degree in Electrical and Computer Engineering from Memorial University, St. John's, Canada, in 2004. He is currently an Associate Professor at the Faculty of Engineering and Applied Science of Memorial University, St. John's, Canada. His research interests include mobile ad hoc and wireless sensor networks, wireless communications and mobile computing, switching and routing, and broadband communication networks. He is an editorial board member of Wireless Communications and Mobile Computing, an associate editor of Security and Communication Networks journal, and an editorial board member of Journal of Networks, International Journal of E-Health and Medical Communications and KSII Transactions on Internet and Information Systems. He has served a technical program committee (TPC) co-chair for the ACM/IEEE MSWiM'13, IEEE WiMob'11, and QBSC'10. He has served as a co-chair for various technical symposia of many international conferences, including the IEEE GLOBECOM and ICC. He has served as the TPC member for many international conferences, including the IEEE ICC, GLOBECOM, and WCNC. He is the recipient of the best paper award in IEEE ICC 2010. 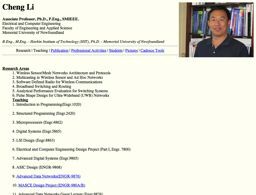 Dr. Li is a registered Professional Engineer (P.Eng.) in Canada and is a Senior Member of the IEEE and a member of the IEEE Communication Society, Computer Society, Vehicular Technology Society, and Ocean Engineering Society.